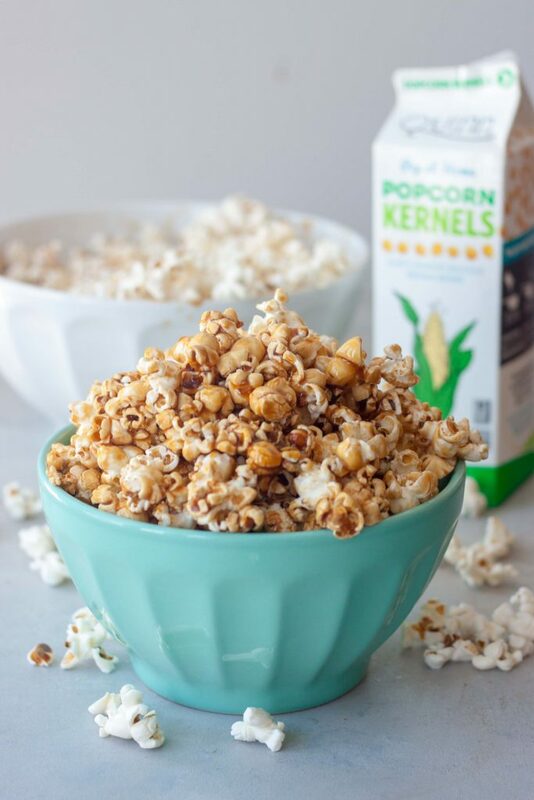 When National Caramel Popcorn Day falls on a Friday and your family loves popcorn you have no choice but to make a batch of Healthier Caramel Popcorn and pop in a movie! Don’t worry it’s super simple and only takes a few ingredients probably already in your kitchen, and if they aren’t they should be. Yes there is still sugar BUT if you are looking for a super (food) healthy version don’t worry I have one of those too. I will note however that while it is good if you are thinking you will get a sticky sweet caramel popcorn you won’t because I stick to real ingredients so I don’t have any magical sugar free caramel popcorn. So first up, the healthier of the two I have for you today, Lucuma Popcorn. This is a version with only 1 tablespoon of coconut palm sugar at most and using lucuma powder as a sweetener. Ok I know you’re like hold up what, Lucuma? Before you’re like what the heck lucuma powder is a low-glycemic sweetener made from whole Peruvian lucuma fruit that has been dried and milled into powder. It’s considered a superfood and includes beta-carotene, iron, zinc, vitamin B3, calcium, and protein. So think of it as a superfood caramel like sprinkle version of one of those flavor powders with manufactured ingredients, only this one is good for you. Pair that with a little coconut palm sugar you still get a sweet popcorn you can crunch on guilt free. See NOTES in the recipe below but all you need is a sprinkle of lucuma powder to taste (roughly 2 teaspoons to 1 tablespoon) and sprinkle of coconut palm sugar (again roughly 2 teaspoons to 1 tablespoon). 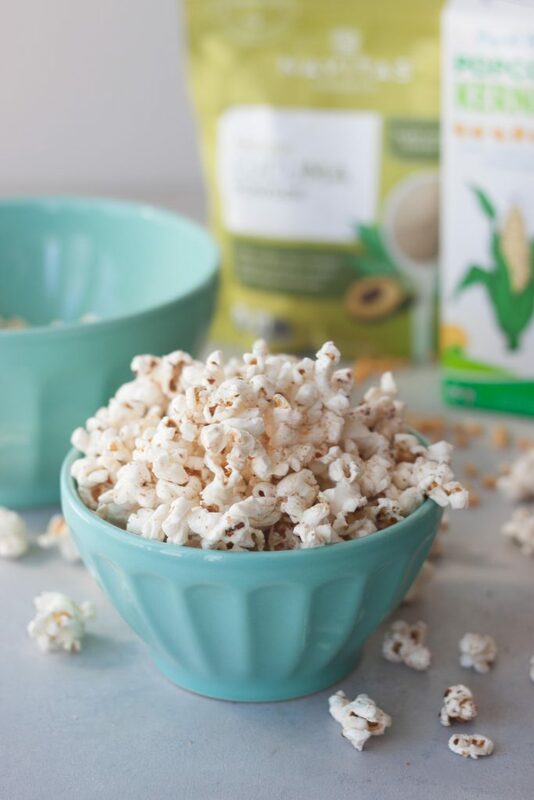 Just sprinkle on top of popcorn made with coconut oil, or drizzle air popped popcorn with a tablespoon of melted coconut oil before sprinkling over top. 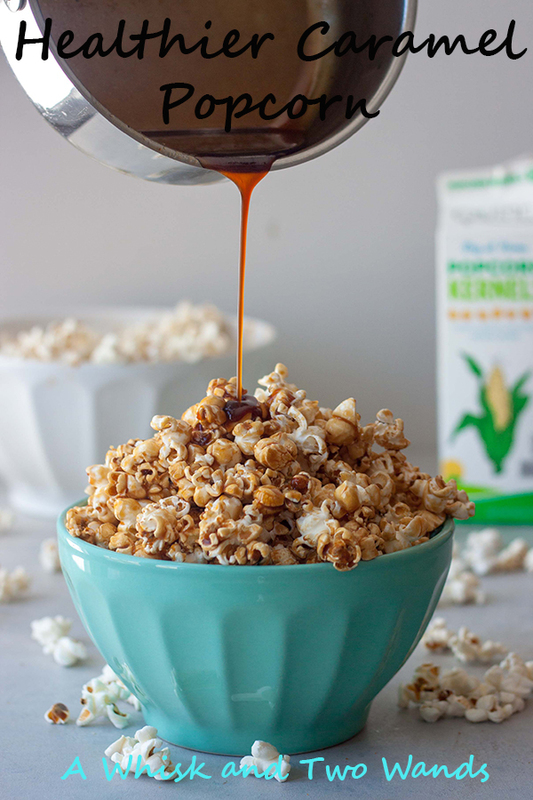 Now to the Healthier Caramel Popcorn that is still DELICIOUS, indulging, and sticky sweet! All you need is popcorn kernels, coconut oil, coconut palm sugar, and either maple syrup, agave, or honey. 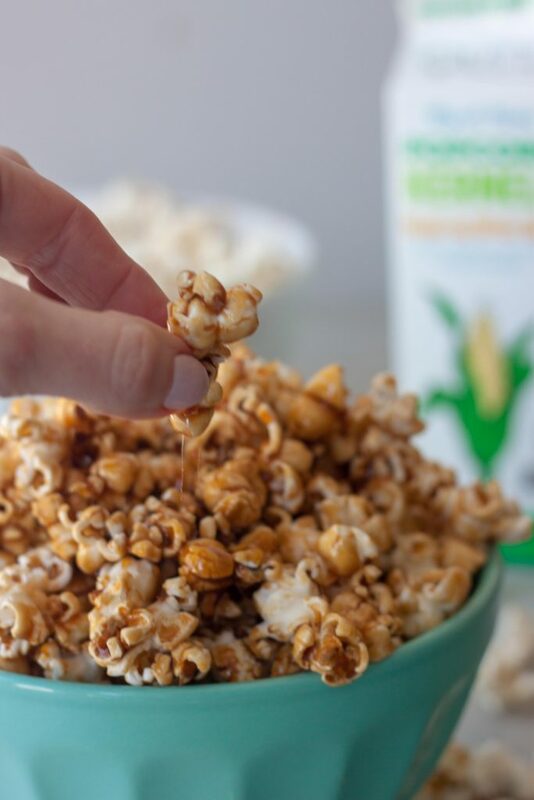 Pop your popcorn, make your caramel, and in less than 10 minutes you have warm sticky sweet caramel corn. Although be careful you don’t dig while it’s still hot. I like to let mine cool a bit so it hardens a little. If you want to use honey you might be interested in this Simply Sweet Honey Popcorn. Using coconut palm sugar will give it much more of a caramel corn flavor vs just sweet. If you don’t have coconut palm sugar they sell it at Target, Trader Joe’s, Whole Foods, and many grocery with the sugar. If you have a Natural Foods Section in your grocery store it might be there. At Trader Joe’s it’s only a few dollars for a bag. Coconut sugar is a staple in our kitchen not only because I love it’s caramel-like flavor (think cane sugar and brown sugar had a baby) but because it’s a low-glycemic option (yes still sugar but healthier and won’t spike your blood sugar) and it’s nutritional profile. It includes amino acids, potassium, magnesium, zinc, iron and B vitamins. If you want a little less caramel coating you can increase the amount of popcorn and use the same amount of caramel. Honestly the hardest part… picking a movie to watch while enjoying it! Speaking of which seen any good movies (or Netflix shows) lately? Share them with me in the comments below so we can check them out! 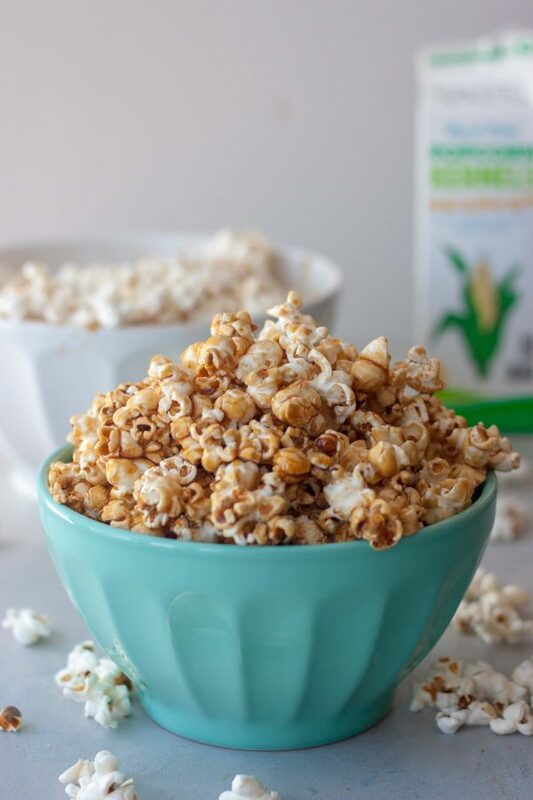 Two quick and Healthier Caramel Popcorn options that take minimal ingredients that still make an indulging healthy treat! Heat coconut oil in large pot with a tight-fitting lid over medium-high heat until melted. Add popcorn kernels, stir quick to coat, and cover with lid. Shake pot (holding lid in place) every 20-30 seconds or so. Remove from heat when there are about 3 seconds between pops. Remove from heat and stir in a salt and optional vanilla. Slowly pour caramel mixture over the popcorn while mixing gentle to coat. Continue to gentle stir ensuring all popcorn gets some sweetness and it all doesn't get stuck to the bottom. Transfer to a bowl and let cool 2-3 minutes, cool enough to touch, before digging in! This popcorn is best enjoyed soon after making as it is like other popcorn that is left out and will get chewy and stale (not a fan of stale popcorn). *If less caramel coating is desired you can increase the popcorn, up to double, adding more oil or cooking in 2 batches. For Lucuma Popcorn pop popcorn as instructed above or if air popping drizzle with 1 tablespoon of melted coconut oil before sprinkling with lucuma powder and coconut sugar to taste (approximately 2 teaspoons- 1 Tablespoon each). Healthier caramel corn is always a plus!